You Don’t Have To Crouch To Carve. If you love the idea of a sportbike, but favor a more classic riding position, this is your Honda. The CB500F is spec’d out with everything you want in a modern sportbike. From its 471cc powerplant to Programmed Fuel Injection (PGM-FI) to aggressive drilled disc brakes to its unique Honda Pro-Link rear suspension, this is a sportbike built to carve corners, but not cut them. And with its light weight and low seat height, it’s the perfect choice for riders ready to move up to a bigger motorcycle. A Winning Twin: The CB500F is powered by the newest version of Honda’s proven twin-cylinder engine. Featuring double overhead cams and liquid cooling, it extracts superior performance from its 471cc’s through every part of its wide powerband. Sit Up And Ride: If you’re not ready for a full racer’s position, you’ll appreciate the CB500F’s classic riding position. You can sit up straighter, without supporting your weight on your arms. It’s a great choice when you’re riding around town or commuting, and you can always tuck in tighter when you want to. And it’s more comfortable for passengers. 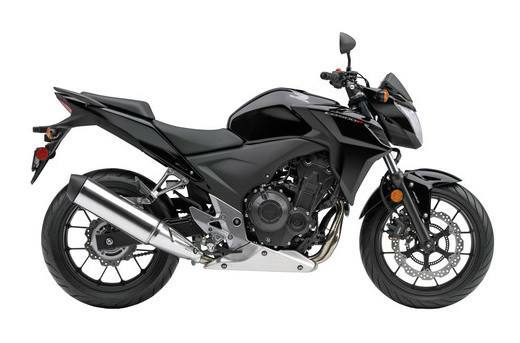 Confidence Is Built-In: As a lighter bike in the 500 class, the CB500F is easier to handle, whether it’s putting it up on the side stand or paddling it backwards into a parking space. And its low seat height makes it easier to plant both feet securely on the ground at stoplights. Unique Style: Less is more when it comes to the new CB500F. Featuring classic, clean, progressive style, the CB500F is a motorcycle that looks great while still providing incredible value and performance. DOHC Twin-Cylinder Engine: Honda twins are famous for their versatility, and the new CB500F engine is one of our best ever. Using the same piston bore size as our CBR600RR sportbike, the parallel-twin engine offers accessible performance across all RPM ranges. Stainless Steel Exhaust: Beautifully polished stainless steel exhaust is integrated with the rear footpeg set for a clean, functional design. The length and diameter of the exhaust pipe contribute to useable power at all RPM ranges. Steel-Tube Frame: A motorcycle's frame is the basis for its handling. A new take on a classic construction, the CB500F's diamond-shaped 35mm steel-tube mainframe ties to the engine with four mounts, offering a rock-solid foundation for a superior ride and handling. Pro-Link Rear Suspension: A sophisticated chassis with Honda Pro-Link rear suspension, nine-stage preload and 4.1" travel give you a comfortable ride over small bumps, while capably absorbing bigger bumps to increase riding comfort and handling. Cast Wheels: Strong and stylish, the CB500F's 12-spoke cast-aluminum wheels are easy to keep clean, look great and are another CB500F feature that just makes sense. Halogen Headlight: A single 60-watt H4 halogen headlight and multi-facet reflector on the CB500F give the front end a unique look and also project plenty of light on the road for visibility. Digital Instrumentation: A full LCD blue-tinted screen features a digital speedometer and tachometer and more, including a clock, odometer, trip meter, real-time and average fuel consumption meters and illuminated engine diagnostic indicators. Step Seat: The new CB500F offers a step seat with a low height. Perfect for around-town riding or out in the canyons, it also offers plenty of room for a passenger and is specially designed to fit a wide range of riders.